One of the best meals of my life was had at Campagnolo, a family style meal with different pasta’s, pizza’s, and antipasti’s. So when I heard about their sister restaurant Campagnolo Roma’s daily lunch sandwich, I had to get down there right away. 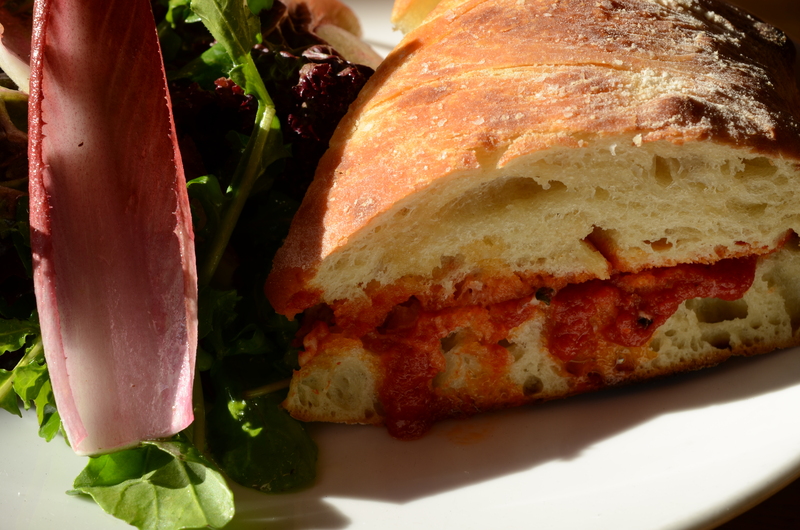 The lunch feature is a toasted Italian sandwich that changes daily, and is only $10 with a salad. The feature sandwich on the day I rolled in was the Pane Bianca, house baked rustic ciabatta bread with a rich tomato sauce, chorizo, saucisson sec, walla walla onions, oregano and provolone piccante. This sandwich is an amazing example of the work they put in at Camp Roma. The chorizo, saucisson sec and ciabatta bread are made in house. 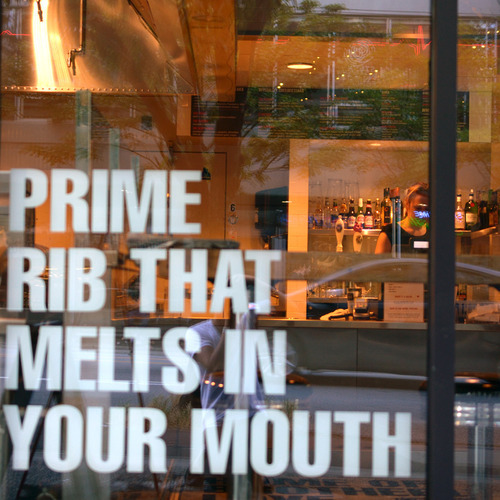 It’s what sets them apart, as not too many restaurants are curing their own meats. The deep, rich tomato sauce seeps into the ciabatta breads pores, the chorizo is smoky with a little spice, the saucisson sec is fatty and flavourful and the walla walla onions are cooked just to that point where they still have a great crunch. All of this is held inside the rustic, crusty and moist ciabatta bread. 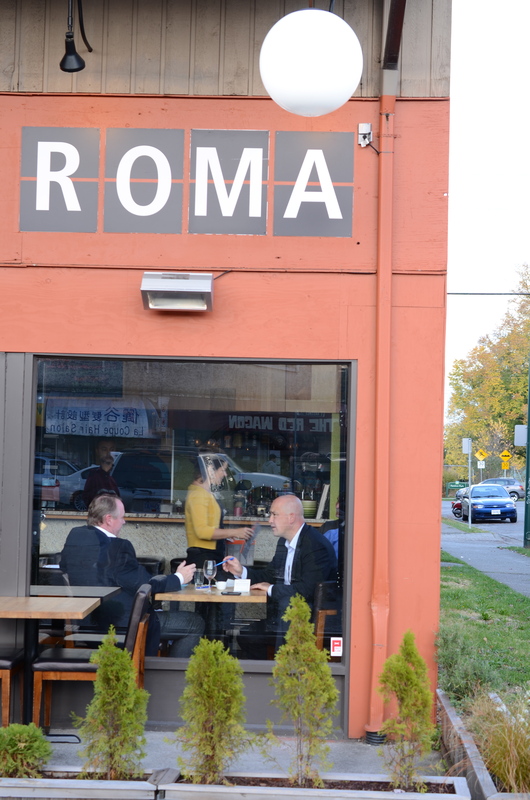 The authenticity of the food at Camp Roma is what stands out. Now I’ve never been to Rome, but I think I have a pretty good idea of what I’d be getting now that I’ve had this sandwich. When it came to the beer to pair with this sandwich, I had to go with restaurants signature beer brewed for them by R&B Brewing. 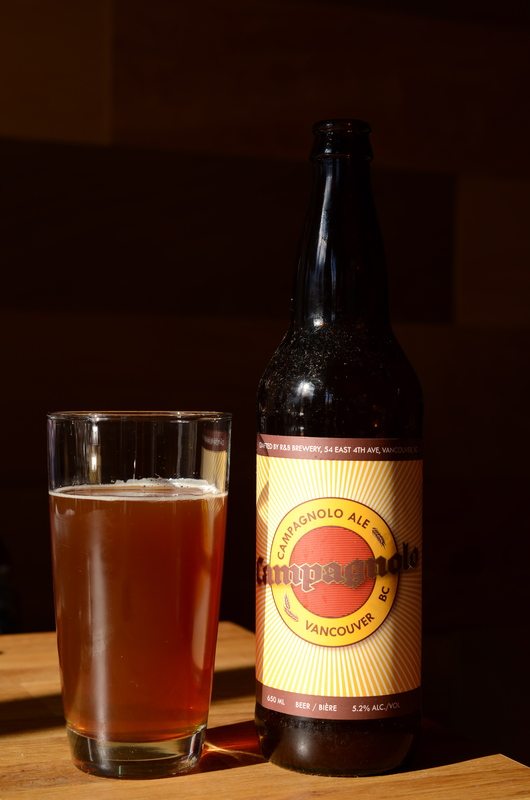 The Campagnolo Ale is a classic American Pale Ale, its malty, a bit sweet and has a subtle hop finish. It works well with the sandwich, because it’s not overly complex. 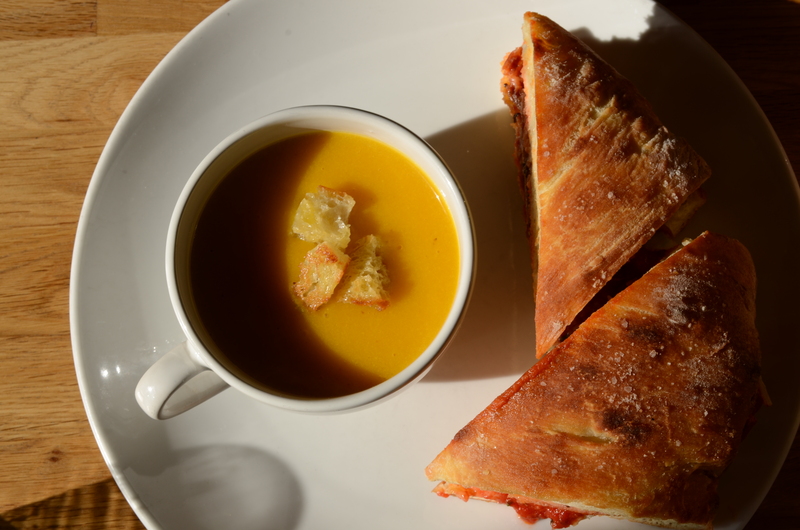 It’s subtle flavours, settle in nicely behind the salty cured meats, spicy provolone cheese and rich tomato sauce. Only available at their restaurants, it’s worth the trip to sit down and enjoy this beer, especially paired with whatever sandwich Campagnolo Roma is featuring on that day. 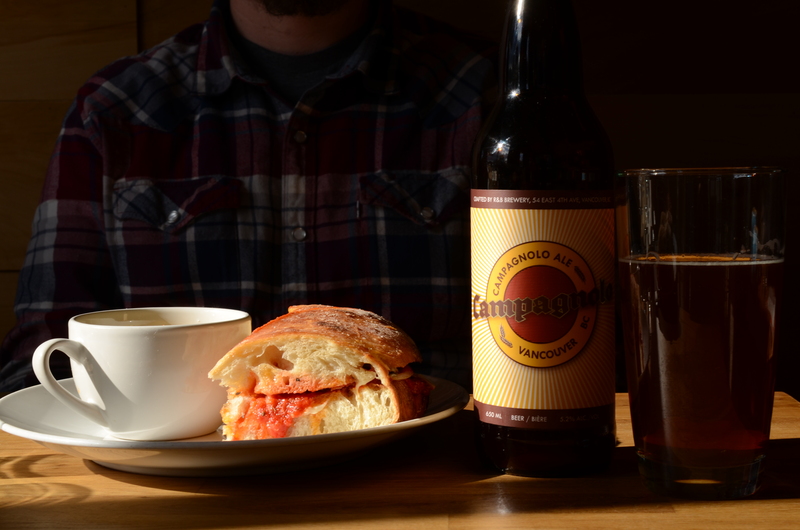 So if you’re looking for an authentic toasted Italian sandwich, at a great price, paired with an exclusive beer from a great local brewery, the head Campagnolo Roma for This Sandwich and That Beer. 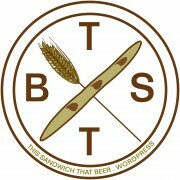 Check out www.campagnoloroma.com and www.r-and-b.com for more info, follow them both on Twitter: @CampRoma and @RandBBrewing, and follow me @TSTB_Blog. Also, catch my monthly radio feature on “Just Here For The Beer Radio” on AM650. 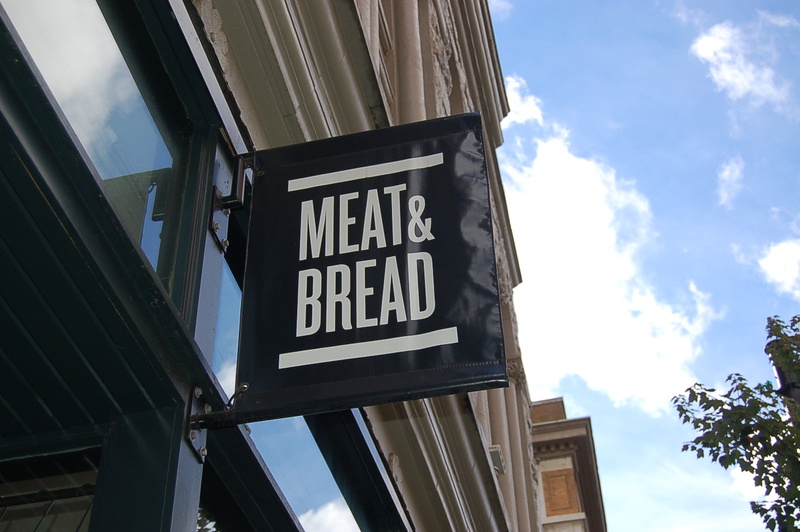 Meat & Bread acted as a bit of an inspiration on the sandwich side, when it came to starting this blog. 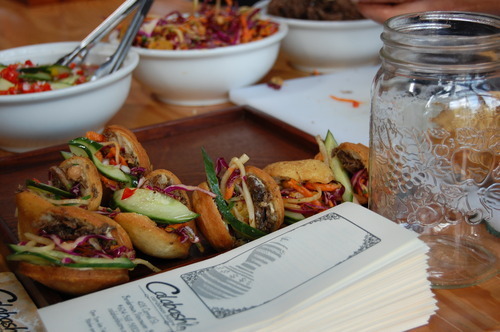 Their commitment to delicious food in sandwich form, done simply is a truly wonderful thing. It’s a shame that it’s taking me this long to write a post on them. But finally the time has come. 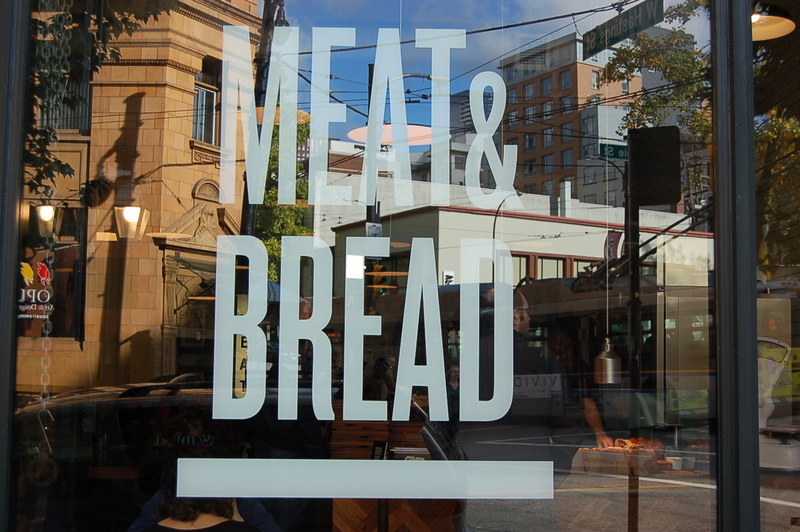 At Meat & Bread, they offer a few options for delicious sandwiches, but when you walk the door, the intoxicating smell of the Porchetta just fills the place and you just can’t resist ordering it. Coming on a warm, fresh and soft ciabatta bun, the porchetta is tender and juicy and full of little crispy pork skin surprises. The herbs and other seasonings in the porchetta, along with a great saltiness coming from the skin combine to create a taste that is unmatched. A generous drizzle of salsa verde adds an additional layer of flavour, that’s completes the sandwich. The sandwich also comes with a dollop of their own brand of yellow mustard on the side. I loved this, because it allowed me to have little tastes of it as I navigated my way through this amazing sandwich. 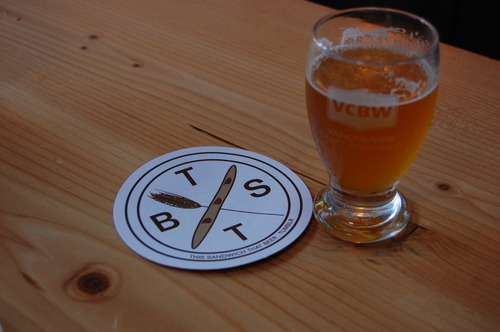 When it comes to beer selection at Meat & Bread, they offer up a rotation of different BC craft beers. They basically just pick up a few cases of whatever they’d like offer that week. The great BC beer of choice the day I rolled in was Central City’s Red Racer Pale Ale. I’m already a big fan of this beer, brewed to be a big pacific northwest style pale ale. It’s crisp and refreshing, offers up a full malt body with a citrus aroma and a delicious hop finish. 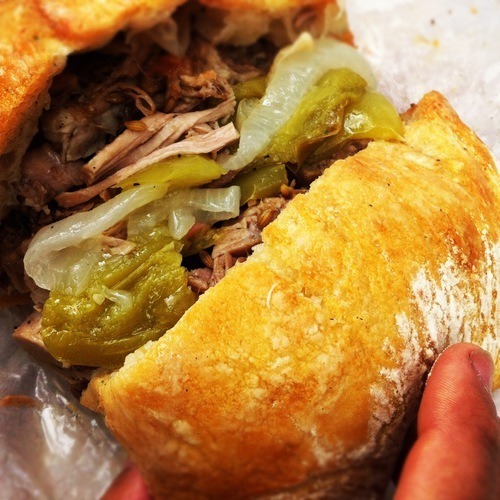 It paired great with the Porchetta, as it was easy to drink along with the rich roasted pork but still stood up to the sandwich’s flavour by having big bold flavours of its own. 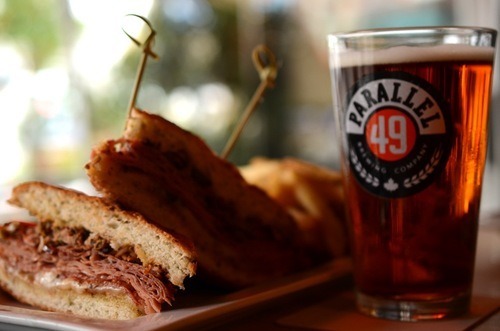 So if you’re looking for a sandwich experience that is truly inspiring, paired with a great local craft beer, then head to Meat & Bread for This Sandwich and That Beer. 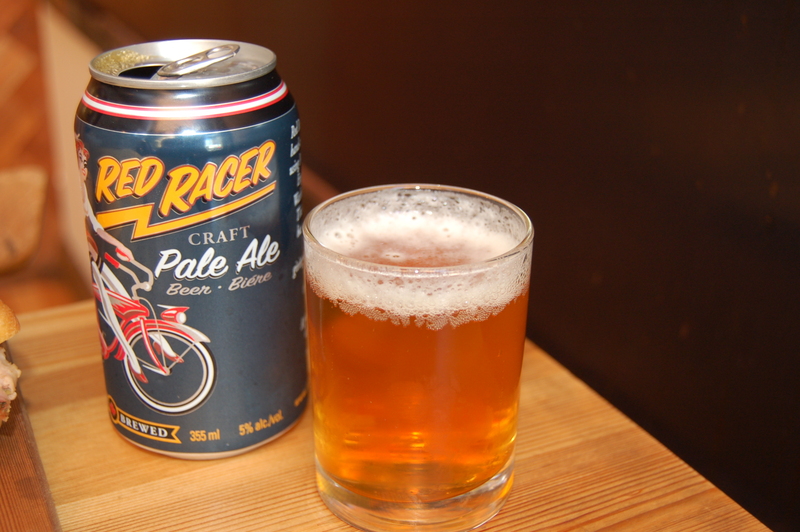 If you’re looking to pick up a six-pack of the Red Racer Pale Ale, then I have to recommend hitting up Legacy Liquor in Olympic Village to find it. 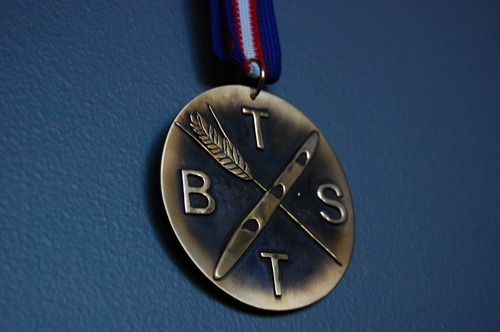 Check out www.meatandbread.ca and www.redracerbeer.com for more info, follow them both on Twitter: @1meatandbread and @RedRacerBeer and follow me @TSTB_Blog. 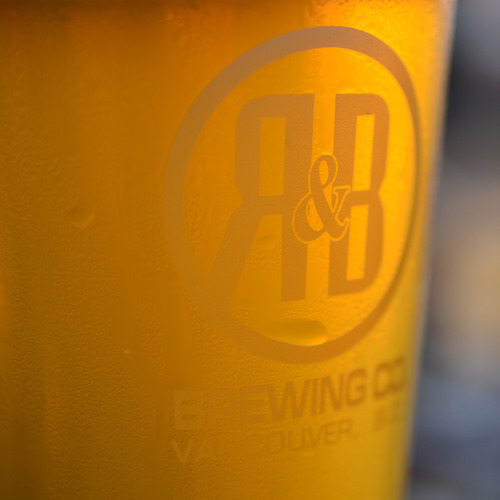 Everyone knows Biercraft for their great beer selection and killer atmosphere, at both their Commercial Drive location and on Cambie. 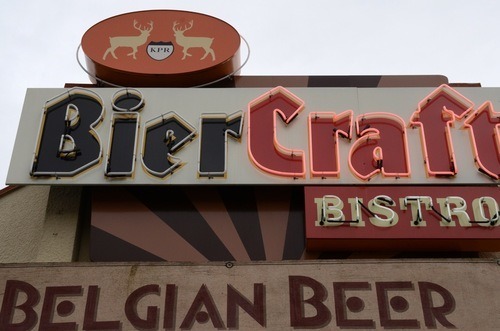 Along with their extensive selection of Belgian and international beers, they carry a great selection of local craft beers. I decided to head over to the Cambie location last week to pair one of those local craft beers with a great sandwich off their menu. 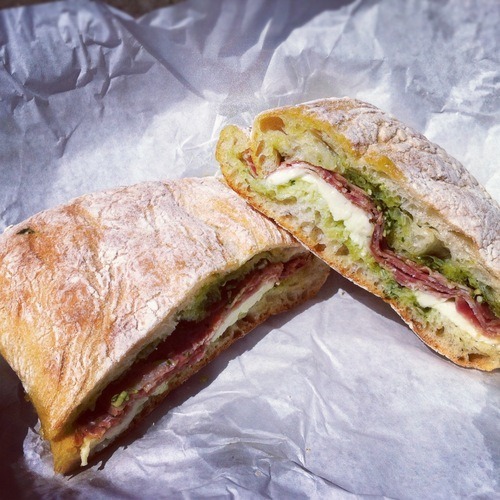 The sandwich of choice was the Muffaletta, a Sicilian style sandwich made popular by Italian immigrants in New Orleans, and one of my personal favourites. Upon arrival at Biercraft, I was greeted by co-owner and certified cicerone Don. After a brief discussion about potential pairings, Don suggested a beer that certainly seemed like and odd partner for the Muffaletta. I trusted his expert opinion and we decided on the Parallel 49 Schadenfreude. 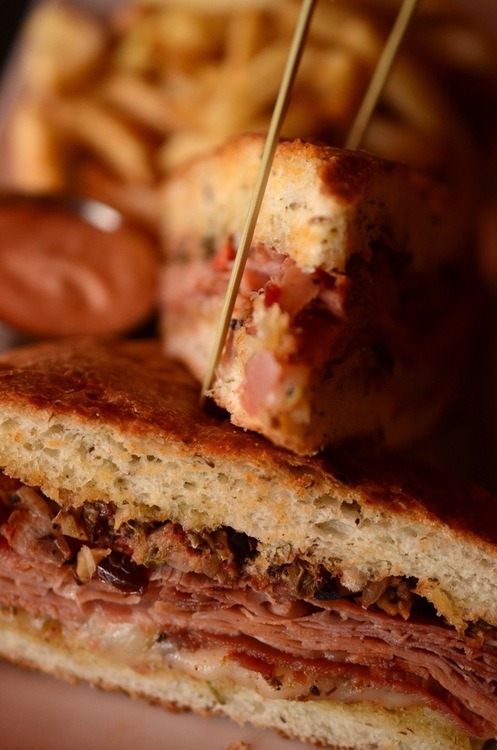 The Muffaletta is a classic and comes with capicollo, mortadella, prosciutto, provolone and a creole olive tapenade on soft, fluffy and fresh focaccia bread. This sandwich was so good. 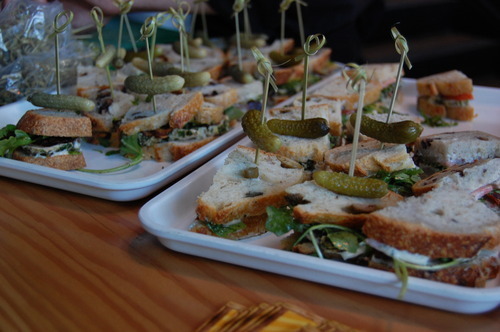 It had just the right combination of salty delicious cured meats with the briny saltiness of the olive tapenade. The capicollo brought the heat, the prosciutto had the salt and the mortadella had the fat. Together they are perfection. The provolone is subtle and the olives are killer and add a great kick! Now, the real secret to the Muffaletta is allowing the olive mixture to soak deep into the bread, and the fresh focaccia was the perfect sponge. I will definitely be coming back for this sandwich many, many, many more times. So, this is where’d you probably expect me to start talking about the crisp pilsner or light European lager to pair with this sandwich. But, we’re taking a bit of left turn here, albeit a seasonally appropriate one, to the Parallel 49 Schadenfreude Pumpkin Oktoberfest. 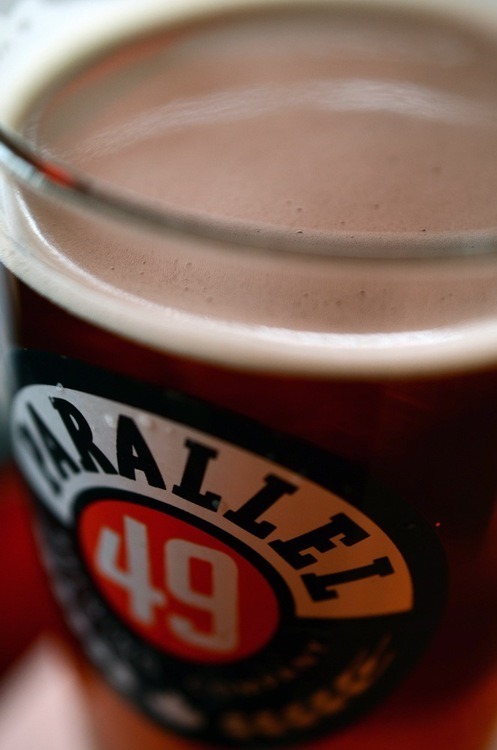 With this Parellel 49 has brought together two seasonal styles, Marzen and Pumpkin, into one truly unique beer. Now, I know that this time of year pumpkin beers are king, but I’ve never really been a fan. This beer however, has made me a believer. Its spice nose, gentle malt flavour, crisp lager mouth-feel and pumpkin finish stand up strong against the intense flavours of the sandwich. It’s not overly sweet like the more common pumpkin ales out there right now. 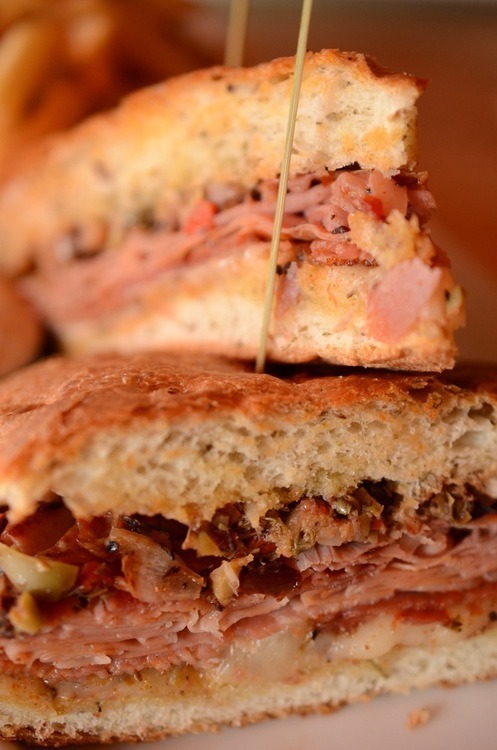 None of its unique characteristics are lost or taken over by the salty cured meats and olives in the Muffaletta. This pairing seemed crazy at first, but ended up being spectacular. 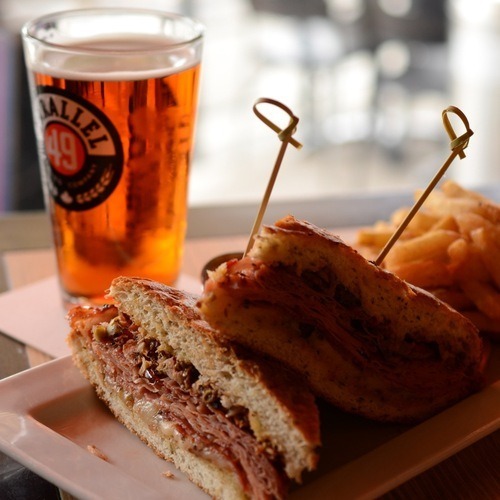 So if you’re looking for a classic Muffaletta paired with a totally original seasonal pumpkin lager from a local brewery doing more than a few incredible beers, then head to Biercraft Bistro for This Sandwich and That Beer. If you’re looking to pick up a six-pack of the Parallel 49 Schadenfreude, then I have to recommend hitting up Legacy Liquor in Olympic Village to find it. Check out http://www.biercraft.com and http://www.parallel49brewing.com for more info, follow them both on Twitter: @biercraft and @Parallel49Beer and follow me @TSTB_Blog. Growing up in Ontario, just outside of Toronto, a few things become engrained. You become a Leafs fan (it’s not easy, trust me), you say cottages not cabins and you love peameal bacon. 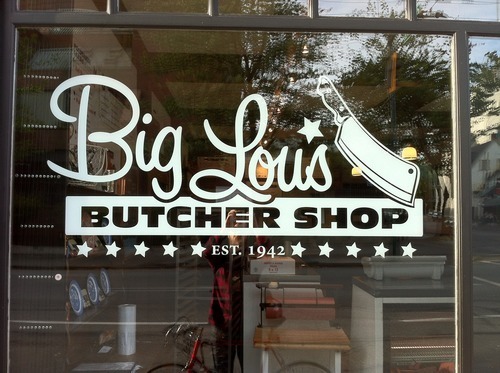 Now a sandwich considered to be Toronto’s signature dish, can be had at Gastown’s Big Lou’s Butcher Shop. Sometimes simplicity in a sandwich is all you need, and that’s exactly what you get with the Peameal Bacon Sandwich at Big Lou’s. 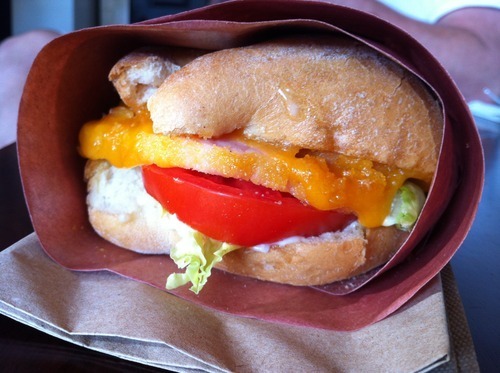 Thick cut slices of juicy and tender peameal bacon, sharp cheddar, lettuce, tomato and mayo on a fresh Portuguese bun. Now, if you’ve had peameal bacon before you know that it’s less like your standard bacon and more like ham. The sandwich drips with every bite and the flavours are classic and familiar. Now, Big Lou’s isn’t a licensed establishment, this allowed me to choose any beer I wanted to pair with this sandwich. 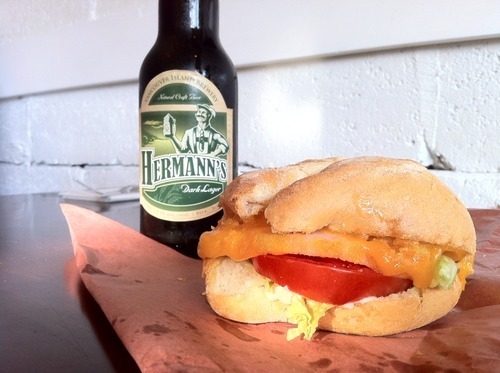 I decided to go with Hermann’s Dark Lager from Vancouver Island Brewery, because I knew that I needed a beer with bold, complex flavours to go with this sandwich. Hermann’s is a made from a traditional German recipe and was one of the first beers brewed by VIB when they started up. It’s full bodied flavour matched up so well with the peamel bacon sandwich, it has a roasty taste and malt nose, with a crisp finish. I even detected some subtle coffee notes that made me think of the classic breakfast paring of coffee and bacon. So if you’re looking for simple, classic and delicious sandwich paired with a fantastic dark lager, then head to Big Lou’s Butcher Shop for This Sandwich and That Beer. 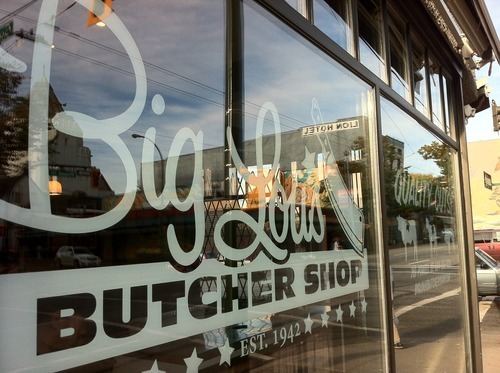 Check out http://biglousbutchershop.com/ and http://www.vanislandbrewery.com for more info, follow them both on Twitter: @biglousbutcher and @vanislebrewery and follow me @TSTB_blog. And, if you’re looking to pick up Vancouver Island Brewery’s Hermann’s Dark Lager check out Legacy Liquor and follow them on Twitter @LegacyLiquor. 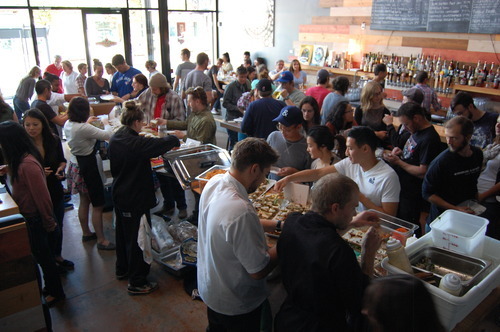 After months of planning, the inaugural “This Sandwich, That Beer Throwdown” went down this past Sunday at Portland Craft. The event was a huge success and raised $1000 for the charity Five Star Footy Club, who put on soccer camps for kids locally and internationally. 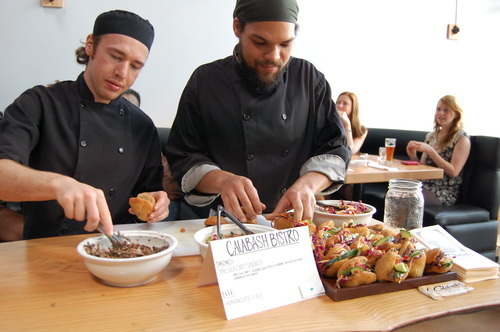 The 6 competing restaurants, Portland Craft, El Camino’s, Calabash Bistro, Cartems Donuts & Earnest Ice Cream, Woodland Smokehouse and Street Meet all brought their “A” games and delivered some serious sandwiches paired with some great beers off the Portland Craft tap list. All the pairings were fantastic and completely unique. Calabash Bistro did a Jerk Duck Confit Sandwich with Jerk Duck Confit, calabash slaw, pickled cucumber, jerk aioli on a bake (Caribbean fried bread), paired with Hopworks Rise Up Red Ale. El Camino’s had their Carne Guisada Bocadillo with Braised beef short rib, caramelized onions, chimichurri sauce, manchego cheese, arugula on a bakery fresh baguette, paired with Main Street Pilsner. Portland Craft had a Southern Meatloaf Sandwich with Slow baked southern meatloaf, bacon and a rich tomato sauce on a fresh potato bun, paired with Alameda Yellow Wolf Imperial IPA. Cartems Donuts & Earnest Ice Cream did up The Donut Ice Cream Burger with chocolate ice cream, sliced mango, strawberry balsamic “ketchup”, apple “mustard” and praline bacon on a lemon poppy seed mini donut, paired with Deschutes Black Butte Porter. 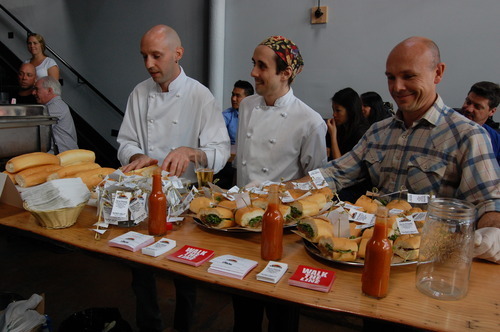 Street Meet created an amazing Seared Albacore Tuna Club with Seared Local Albacore Tuna, Crisp Pancetta, Tarragon Aioli, Heirloom Tomato, Arugula, Bakery Fresh Olive Bread, paired with Lagunitas IPA. Woodland Smokehouse brought their Smoked Meat Sandwich with thick cut smoked meat, bourbon mustard on rye bread, paired with Elysian Dragonstooth Stout. 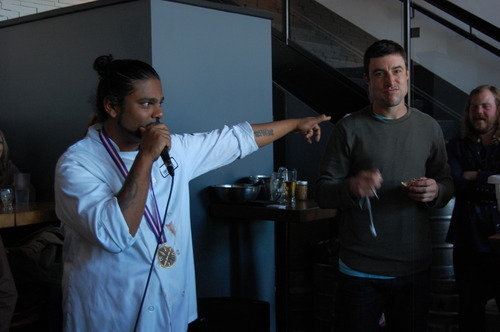 All of the pairings were spectacular, but in the end one was named the champion by the guests in attendance. 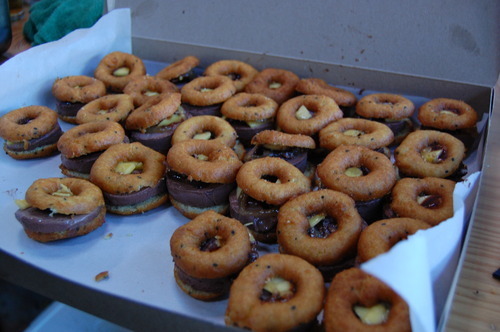 Cartems Donuts & Earnest Ice Cream took home the medal for the top sandwich and beer pairing of the day! 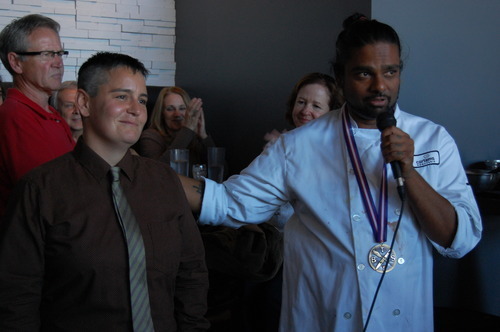 A huge thanks goes out to all the restaurants who competed, to Portland Craft for hosting, to all the guests who bought tickets and helped a great cause and an extra special thanks to Stephanie Frigon, my partner in creating totally awesome event. 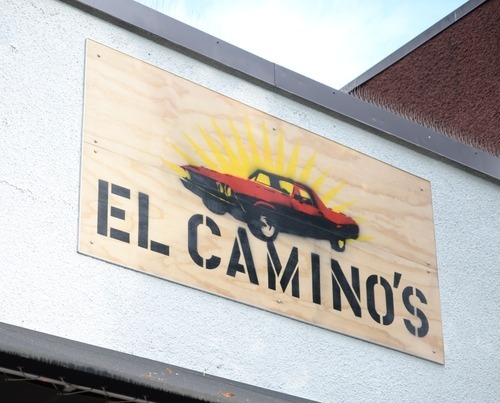 El Camino’s is a really cool spot on Main Street serving up an array Latin American street food that you won’t find anywhere else. 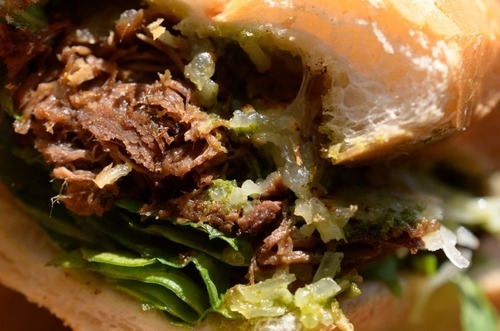 They’re doing empanadas, tacos, arepas, and Mexican style sub sandwiches called bocadillos. 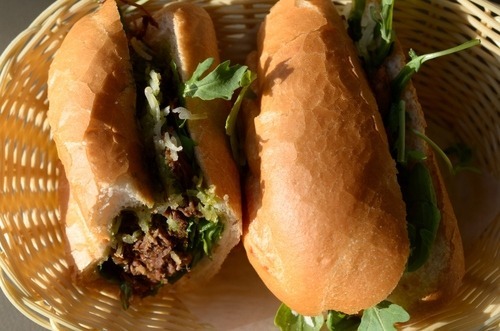 Bocadillos were traditionally seen as a humble food that was low-cost and could contain a number of different ingredients. 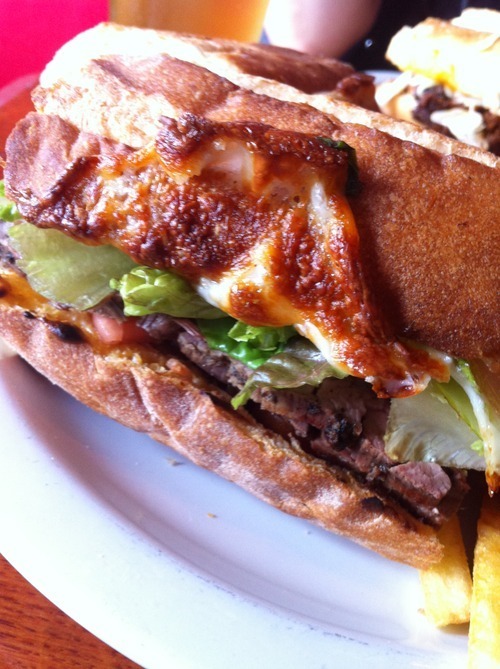 El Camino’s sticks with the tradition by offering up five different types of bocadillos, at a very modest price. I went for the Carne Guisada, a fresh baked French roll filled with braised beef short rib, caramelized onions, chimichurri, manchego cheese and arugula. The braised beef short rib is packed with Mexican flavours, it’s smoky, a bit sweet and so juicy. The onions add a bit more sweetness as the natural sugars are intensified when they’re being caramelized and the manchego melts just enough to be a bit gooey, but still keeps its sharpness. 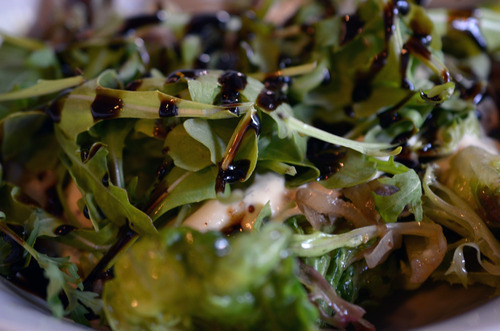 A necessary acidity comes from the chimichurri and the arugula is the perfect greens with its peppery bitterness. 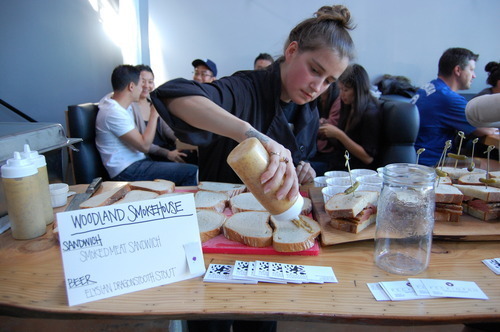 These last two ingredients combine to give the sandwich a really great earthiness. All these flavours blend perfectly inside the fresh roll, with its crunchy, flaky outside crust, and soft inside. 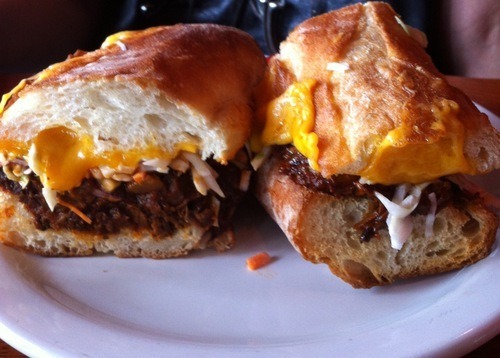 This sandwich, or bocadillo I should say, ranks very high on my list as one of the best I’ve ever had. 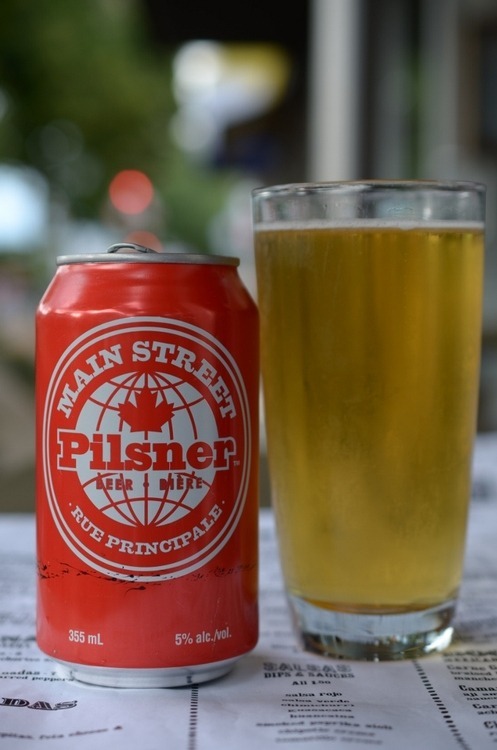 The brain child of El Camino’s owner Nigel Pike and Portland Craft owner Cameron Forsyth, Main Street Pilsner is what they call a quality “no fuss beer” that tastes like beer. Now, I chose this beer for two reasons. 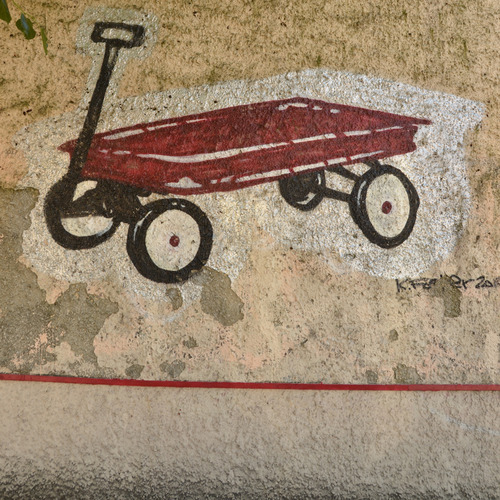 The first being, that it’s locally made and named for the very street that El Camino’s calls home. The second is that it’s a delicious pilsner that finishes crisp and clean. 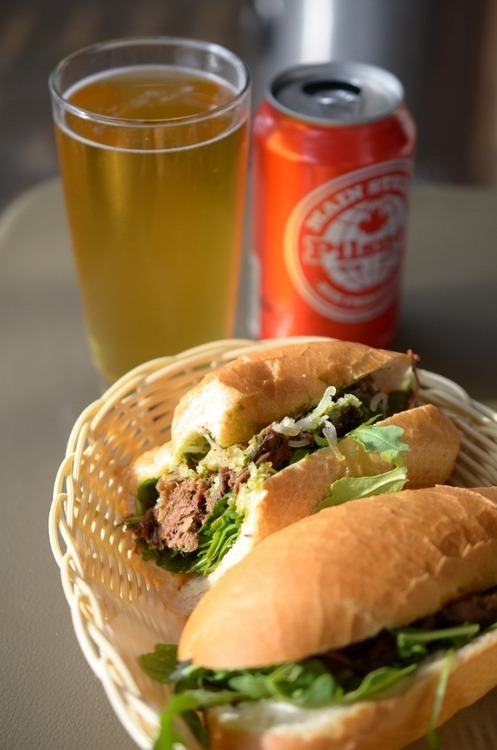 Brewed for them by the guys at Russell Brewing, Main Street Pilsner makes a great partner to this amazing sandwich simply because it’s a classic pilsner. It’s crisp and doesn’t compete with any of the flavours in the sandwich. It cuts through the rich, meaty short ribs and has a clean finish. And if you head in on a Sunday you can get this combo for $10. So if you’re looking for a true, authentic Latin American street food experience paired with a well-crafted, locally made classic style pilsner then head to El Camino’s for This Sandwich and That Beer. Check out www.elcaminos.ca and www.mainstreetpilsner.com for more info, follow them both on Twitter: @El_Caminos and @mainstreetbeer and follow me @betweenbreadme. The American Cheesesteak Co: The Philly and The Cowboy with R&B Brewing Bohemian Lager and Red Devil Pale Ale. Everyone knows the legendary regional classic sandwich the “Philly Cheesesteak”. 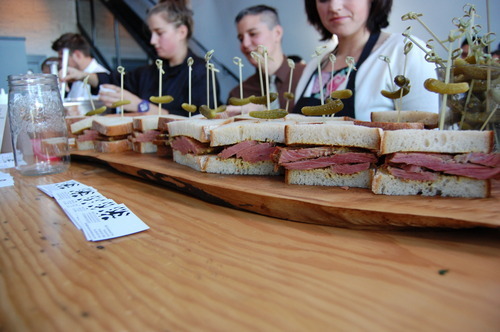 A local chef, who gained celebrity status after he won Food Network Canada’s Superstar Chef Challenge and hosted his own show The Main for four seasons, had a dream to bring this classic sandwich to his hometown. 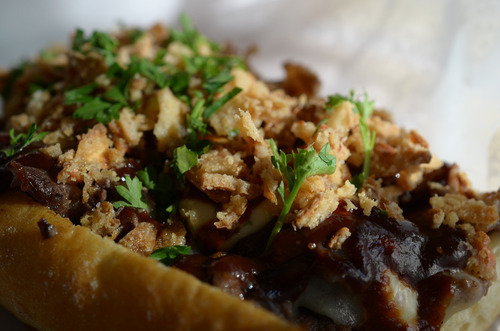 Sadly, Chef Anthony Sedlak left us far too early after passing away a few months ago, but his vision and truly original creations will live on at The American Cheesesteak Co. for many years to come. 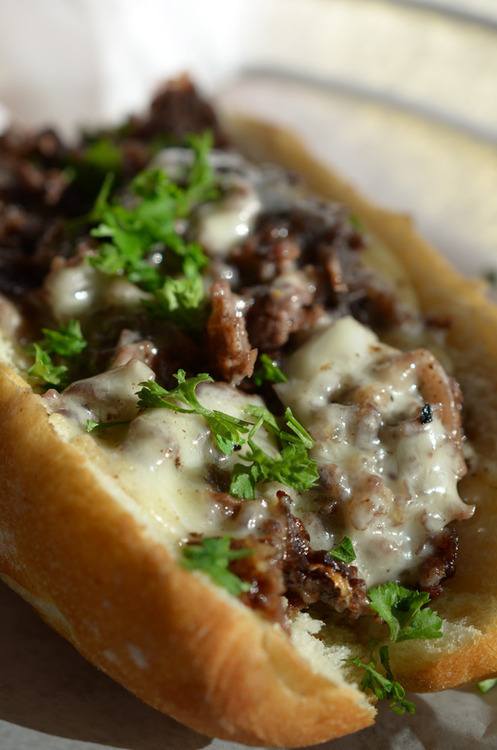 The menu at The American Cheesesteak Co. is split into traditional cheesesteaks and decadent specialties. I figured that I had to try one of each. Off the traditional menu I went for “The Philly”, and chose “The Cowboy” off the specialties menu. “The Philly” is your standard shaved prime rib and American cheese on a daily house baked roll. It did not disappoint, the prime rib was melt-in-your-mouth tender and packed with flavor. The American cheese melted all over the top, was gooey and familiar and the roll was lightly toasted to make it crispy and warm. “The Cowboy” is where Anthony show’s us what can be added to this classic sandwich to take it to new heights. The same juicy shaved prime rib, slathered in a spicy housemade BBQ sauce, with melted aged white cheddar, crispy fried onions and an unreal bacon mayo. The BBQ sauce is the star of this sandwich, it’s smoky and spicy and sweet, but still allows for the prime rib’s flavor to come through. The crispy onions provide the crunch, the aged white cheddar was sharp and the bacon mayo gave it something totally unique. Both sandwiches were great, “The Philly” gives you what you expect and more from a philly cheesesteak, and “The Cowboy” delivers the unexpected. Another cool thing they do is give you the option to have any of their cheesesteak creations served as a salad on a bed of crisp mixed greens. I had “The Bifteck” in this preparation, the shaved prime rib with caramelized onion jam, double cream brie, arugula and Dijon. 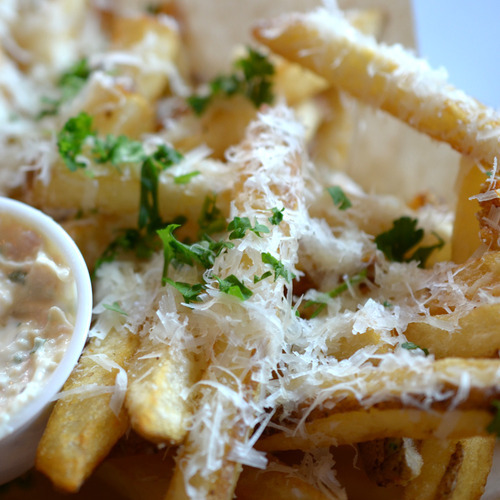 I also had the ACC fries, house cut fries that are tossed with garlic, parsley and parmesan and served with a side of parmesan bacon dipping sauce. This was all topped off with a homemade chocolate chip cookie and vanilla ice cream sandwich! So, considering I had two different sandwiches I figured I had to have two different beers. Luckily they offer two great beers from R&B Brewing on tap, the Red Devil Pale Ale and the Bohemian Lager. I decided to pair the less complex sandwich with the more complex beer and vice versa. That meant “The Philly” paired with the Red Devil, a traditional English style pale ale with a hoppy floral aroma and malty sweetness and “The Cowboy” with the Bohemian, which is a Euro-style pilsner modestly hopped with three types of hops to give it that North American essence. 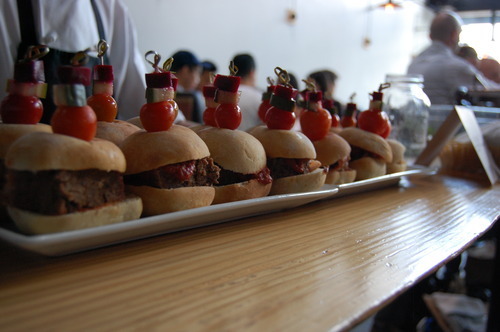 Both pairings worked really well, the Red Devil made a great companion to the simple flavours of “The Philly”. Whereas, the Bohemian matched perfect with “The Cowboy” and all its different flavours. 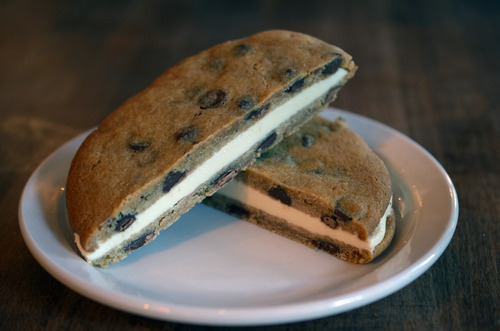 I decided not pair a beer with the ice cream sandwich, probably a good idea, considering they serve 22 ounce pints. 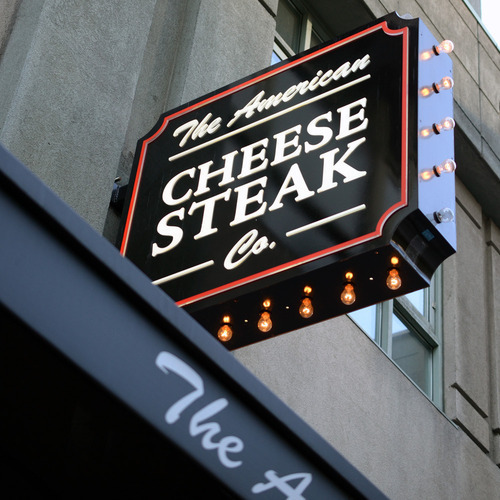 I’ll end this post with some words about The American Cheesesteak Co. right from the mouth of Chef Anthony Sedlak himself, “We want to wow people with simple flavours produced through flawless techniques, bringing to life the story behind the dishes we present at the restaurant. Trends come and go, but classics last forever.” So if you want to experience Anthony’s vision and creations then head on in for these sandwiches and these beers. Check out www.americancheesesteak.com and www.r-and-b.com for more info, follow them both on Twitter @thecheesesteak and @RandBBrewing and follow me @betweenbreadme. Whenever I find myself in the Hastings-Sunrise area, or as it’s been newly named “The East Village”, I always get that neigbourhood feeling. My reason for being there this time was to hit The Red Wagon Restaurant for a sandwich I’d been hearing a lot about and a beer that’s been a favorite since it first hit the shelves. 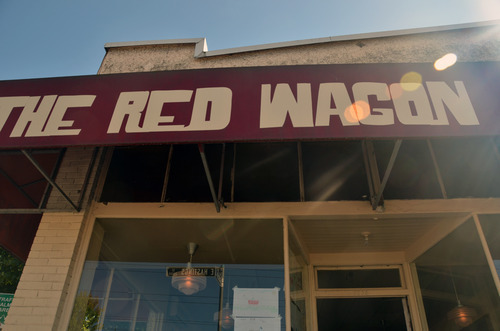 The Red Wagon Restaurant is a true “neighbourhood joint”, with a super friendly staff and a loyal customer base that is often lined up out the door. 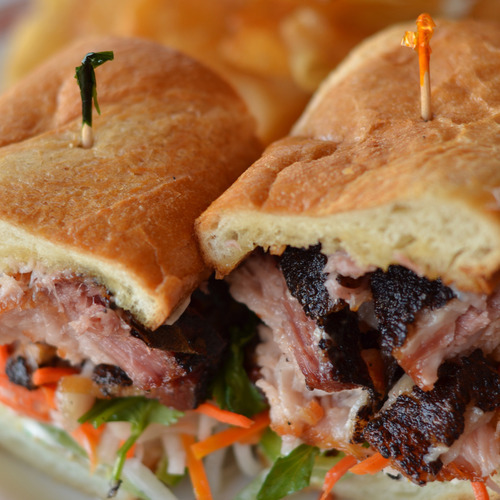 I headed in to try the Crisp Pork Belly Sandwich, a soft, fresh baguette loaded with cured pork belly that’s deep fried to give it a crispy outer crust with soft and tender inside. The sandwich comes with pickled veg, jalapeño, cilantro and mayo, and house made chips on the side. The first thing that hit me when it arrived at the table was the smell, it was intoxicating. The pork belly was piled high, and glistening. The meat was fatty and delicious, with a texture that’s unmatched by any other meat. There was great heat from the jalapeno, and the pickled veg was nice and tangy. 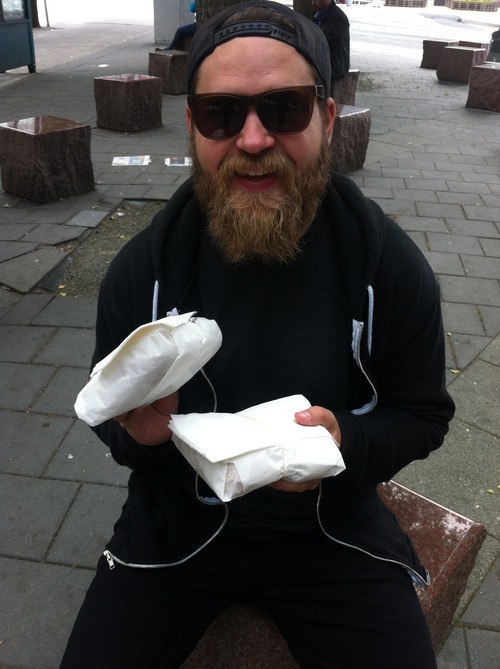 I really enjoyed that the bread was super soft, it made it easy to bite through, but then you got a nice crunch from the crispy pork belly. 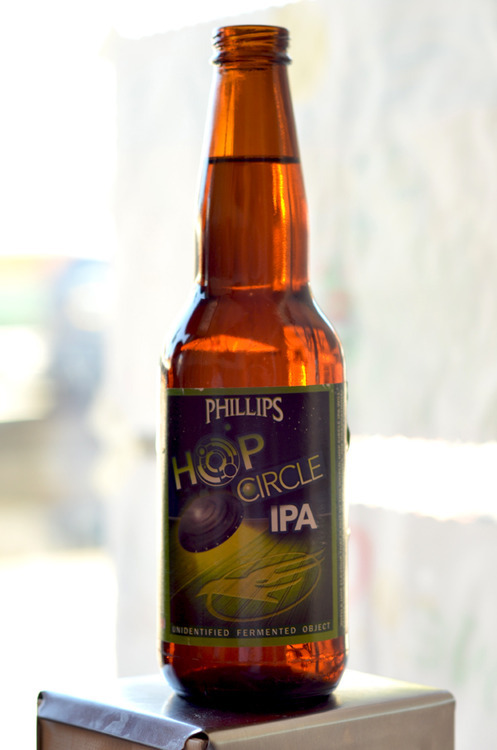 My beer choice on this occasion was the Phillips Hop Circle IPA, and if you’ve had this beer before, you know that it’s an IPA that doesn’t shy away from the hops. It has a serious hop nose as well as an intense hop finish. But, it’s not a heavy ale, it finishes nice and crisp which was a perfect match for this sandwich. The intensity of the hops cut through the fat from the pork belly but doesn’t compete with the pork’s flavor. These two went together even better than I expected. The bold flavors from both end up standing up to each other without giving up any of their defining characteristics. 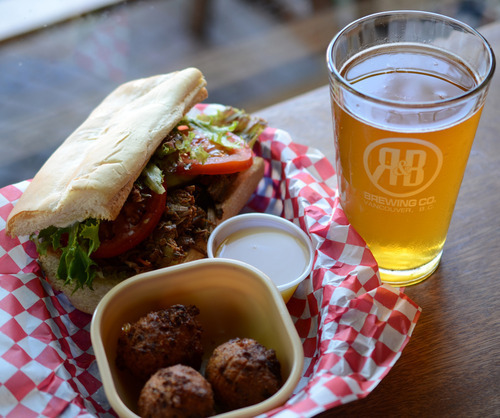 Something that made this combination even better was when I found out from Red Wagon Chef Brad, that these items are both his favorite sandwich and his favorite beer that they serve. 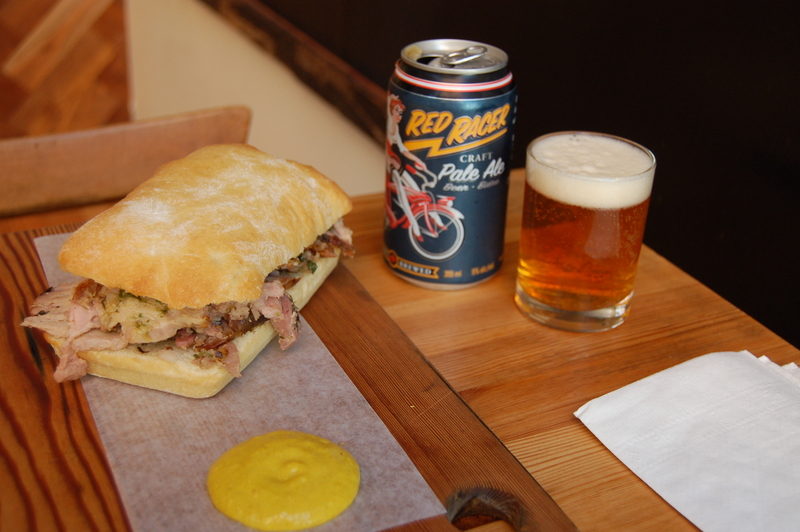 So if you’re looking for the chef’s picks at Red Wagon, then head on in for This Sandwich and That Beer. Check out www.redwagoncafe.com and www.phillipsbeer.com for more info, follow them both on Twitter: @redwagoncafe and @phillipsbeer and follow @betweenbreadme. Earlier this week, my girlfriend and I went down to Seattle to see the Blue Jays for my birthday. We really wanted to make the most of only a couple days, so that meant we had to find the best sandwiches and some wicked beers! So, on the recommendations of some good friends we knew the spots we had to hit. We arrived on Monday around 2pm, checked into our hotel and headed straight to The Honey Hole in Capitol Hill. We were told that this was the place for big tasty sandwiches and we had to check it out. Walking in the door you see tons of framed vintage photos, including one of The Beatles in the ring with Muhammad Ali, and a bunch of crazy knick knacks decorating the room. We had done a bit of research prior to our arrival, so right away we ordered “The Dude” (marinated and grilled flank steak, melted provolone, sautéed onions, fresh tomato relish, mix greens, sweet hot mustard on a demi baguette) and “The Bandit” (slow smoked all natural Painted Hills beef brisket with their classic BBQ sauce, coleslaw, and melted Tillamook cheddar cheese on a demi baguette). 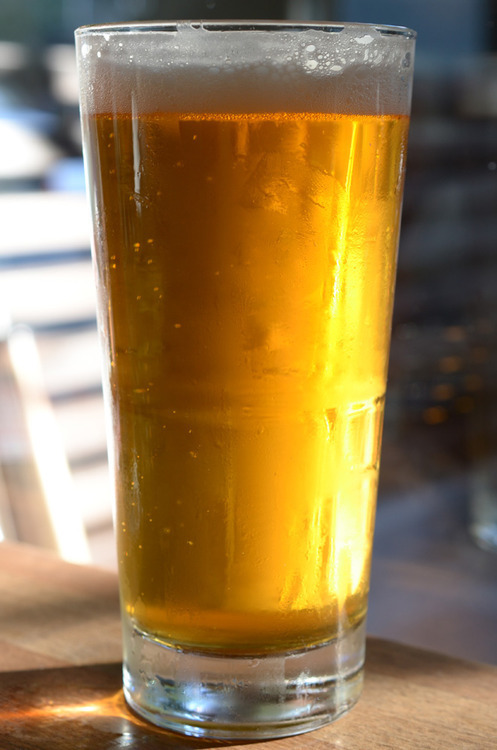 Beer was a bit of a tougher choice until they told us that they had pints of Boundary Bay Blonde on special…for $3! We placed our order, grabbed our pints and headed to a table. 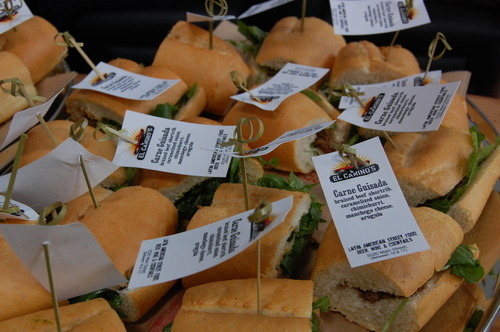 The sandwiches arrived a few minutes later and looked awesome, we shared both and they did not disappoint. The next morning we woke up bright and early because we were headed to Salumi’s Artisan Cured Meats, a place that is only open Tues – Fri from 11:00am to 3:30pm, and rumor had it that the lineup for lunch there usually starts about half an hour before they open. We walked up around 10:45am and sure enough the line was already about 20 people deep, so we got our spot and waited for it to open. Once the doors opened the line moved at a good pace and when we got inside my girlfriend looked at me and said she wished she could take a picture of how it smelled in there, it was unreal. 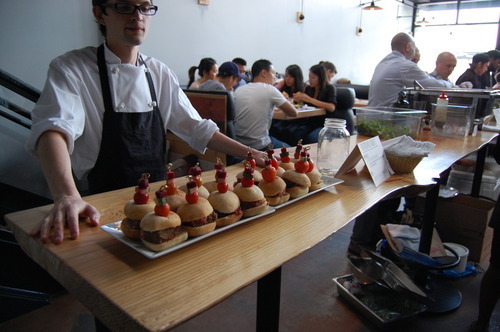 We had already decided on the Porchetta and the daily special before got to the counter. The special was your choice of salami (we chose the Salumi salami) with arugula pesto with the option to add cheese, which we did (fresh house made mozzarella). They offer 3 different types of bread, we chose the guiseppe bread for both, similar to ciabatta, but lighter. We watched them slather the bread with the arugula pesto and load it with salami and the fresh mozzarella for the special. For the porchetta they did the coolest thing., they cut the bun in half from top to bottom and then sliced pockets in to each half, then packed each half with that juicy, fatty, deliciously herbed pork and topped it with sautéed onion and peppers. We found ourselves a spot on the curb across the street and delved into the porchetta, the meat had the most amazing flavor and the bread absorbed all the juices from the pork. We made the decision to hold off on the salami sandwich till later in the day, it was a smart choice, we ended up lounging on a beach in West Seattle in the afternoon and enjoyed the second sandwich along with some Miller High Life – the champagne of beers on my champagne birthday! We also hit up a couple great Seattle breweries while we were there, Elysian Brewing and The Pike Brewing Company. 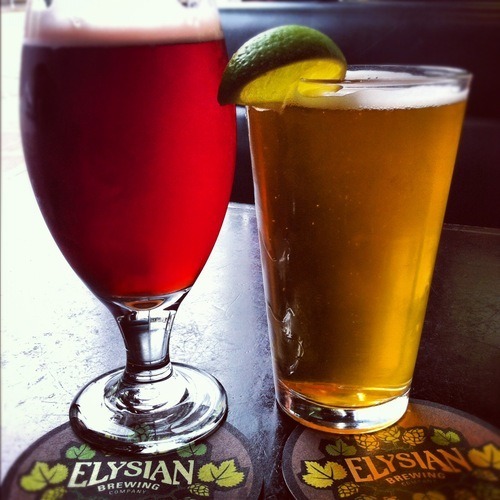 Elysian can be found in Capitol Hill not far from The Honey Hole, and Pike is down by the market on 1st. Both breweries consistently deliver great craft beers. At Elysian I had the “Torrent” Pale Beet Bock, which is the latest in their 12 beers of the apocalypse series. And yes there was beet in it, and yes you could taste it, and yes it was delicious. My girlfriend had the “Hombre”, a classic easy drinking Mexican Lager. 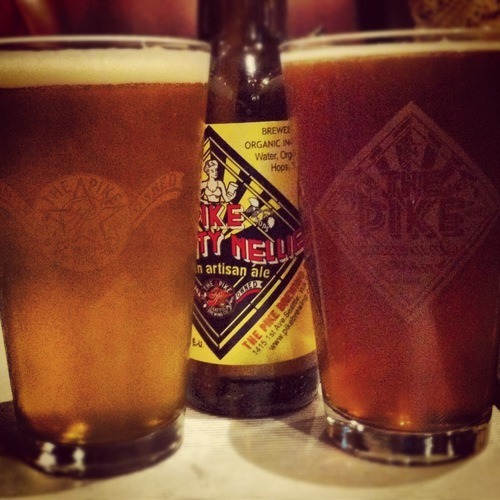 We then headed over to Pike, which is massive, and pretty much a museum of beer history. I went with the Pike Kilt Lifter “Scotch Style Ruby Ale”, a rich malty ale with a subtle smokiness, that reminds you of single malt. My girlfriend, she went for the Pike Naughty Nellie “Golden Artisan Ale”, the staple of the Pike brewery. We had a great time at both breweries and we’ll definitely be back next time were in Seattle. 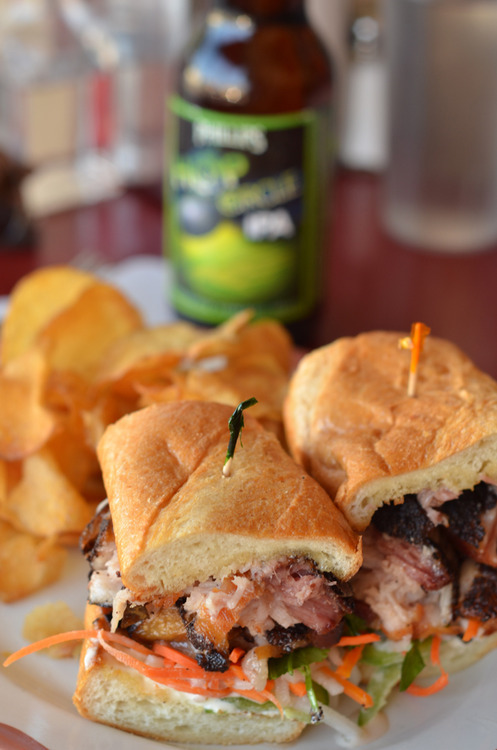 We’re so lucky that we have friends that love beer and sandwiches as much as we do so they can recommend such delicious places and we can pass it along to you! The first thing that hit me when I walked through the doors of Peckinpah, was the distinct smoky smell of Carolina style barbecue that they’ve been emitting through Gastown for the past couple years. Their massive smoker at the back of the restaurant is smoking pounds of pulled pork, beef short ribs, pork ribs, chicken, jalapeno pork sausages and beef brisket, which is all locally sourced. Not only can you get all that delicious smoked meat piled on huge platters, they’re also throwing it on some mouthwatering sandwiches. 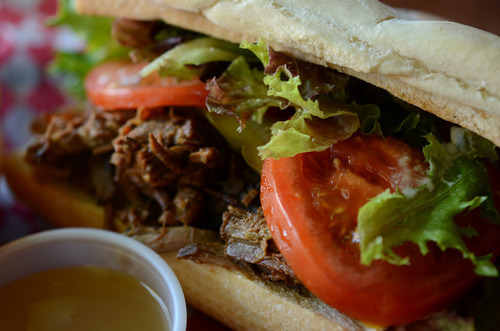 I went for the Chopped Beef Po’boy, with marinated beef brisket, lettuce, tomato, mayo and pickles on fresh baked French baguette. The beef was fall apart tender and deliciously smoky, with that unparalleled brisket juiciness. The lettuce and tomato added a great crisp, freshness and the acidity of the pickle cut through nicely. The bread was crusty on the outside and then soft on the inside, perfect for absorbing the juice from the beef brisket. And even though it’s considered by some to be “sacrilege” in Carolina style barbecue, Peckinpah have a house made tomato based BBQ sauce (the owner’s secret recipe) on the table to pour all over that sandwich, and it’s awesome. There’s also a vinegar based Carolina style sauce on the table. 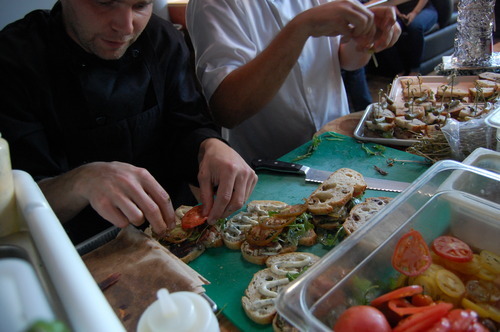 They use it to mop the meat prior to smoking; you can use to re-introduce those regional flavours to the sandwich. 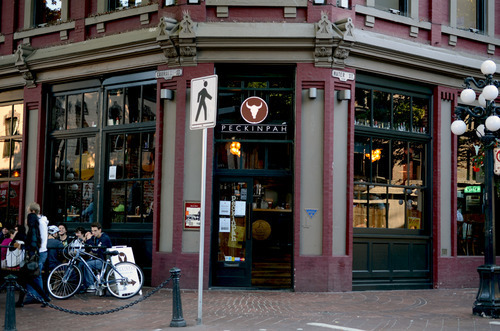 Peckinpah offers an excellent selection of local beers, as well as some others from the Pacific Northwest region and from across North America. I chose to pair this sandwich with R&B’s Hoppelganger IPA, a true North West style India Pale Ale from right here in Vancouver. 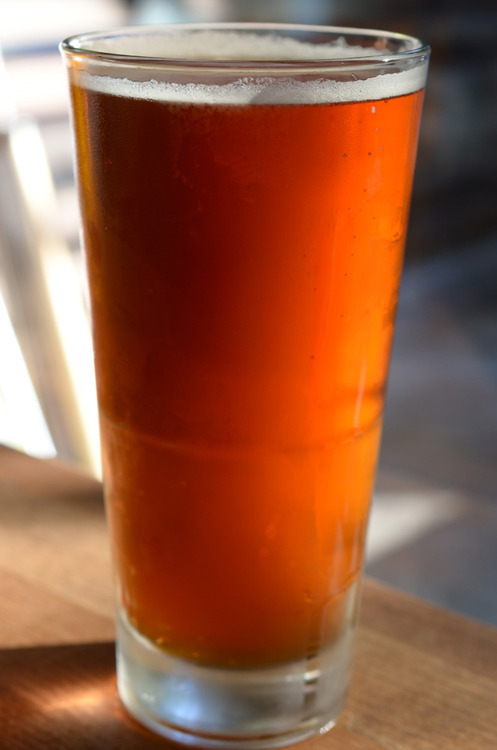 This beer is crisp and clean with a slightly sweet finish that pairs well with the smoky flavor from the beef and the sweetness of that killer BBQ sauce. Then the beer hits you with an aggressive hop bitterness to remind you that it’s a serious IPA. I found that the flavor combination in the sandwich actually enhanced the hop flavor in the beer, which I loved. So, if you’re looking for a true, authentic Carolina style barbecue experience on a bun with a well-crafted, locally made IPA then head to Peckinpah for This Sandwich and That Beer. Check out www.peckinpahbbq.com and www.r-and-b.com for more info, follow them both on Twitter: @PeckinpahBBQ and @RandBBrewing and follow @betweenbreadme.